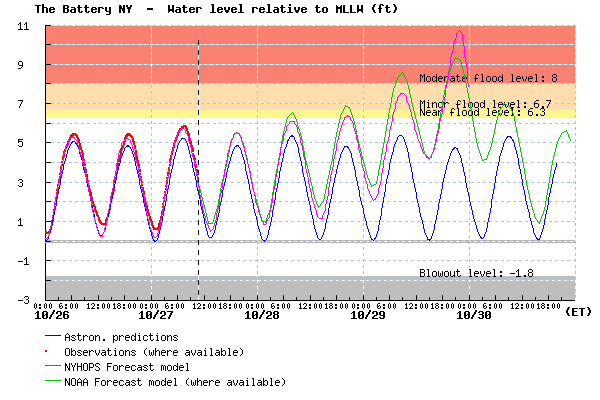 Our six-hour update just came in and it’s not good news for New York City and areas of New Jersey inside NY/NJ Harbor — the model forecast for Monday night rose two feet higher at The Battery, so now it calls for a flood elevation of 10.8 ft above MLLW (normal daily low tide), which is 1.3 ft higher than Irene’s flood elevation and about 3 ft above the area’s lowest seawalls. This is bad news, but the forecast is still highly changeable. The flood elevation is a combination of a 6.5 ft storm surge coinciding with the time of a high tide, so slight changes to storm surge timing could help reduce the forecast water level. The forecast flood elevation at Kings Point is still about 13 ft, but it is noteworthy that it would be a 7 ft storm surge that is arriving three hours before the time of high tide, so it could be worse with a slight delay in arrival time. If the Battery forecast should hold or worsen, these would be the highest flood elevations in the 80 years that records have been kept at that location. Unless efforts are taken to protect vulnerable infrastructure, this would cause some subways, highway tunnels, and electrical infrastructure to be filled with salt water and shut down for weeks. And beyond that, I would estimate the 10% likelihood exceedance flood elevation (sort of like a mild version of a worst-case scenario) for Sandy to be about 3 feet higher than this forecast. This could occur if the peak surge coincides with high tide and the storm ends up making landfall with stronger peak winds than are currently predicted. This entry was posted in water, weather and tagged forecast, Frankenstorm, hurricane, long island, Long Island Sound, new jersey, New York City, predicted, Sandy, storm surge, storm tide, tidal range, tide, wind. Bookmark the permalink. Phil, can you say a little more about how the surge depends on the track? What is the worst landfall location (and direction of storm motion at landfall) for different points in the NY harbor and estuary, and how far are current forecasts from that worst case? It depends on who you are talking about. If you are talking somewhere near the center of the storm, then it depends a lot because the winds could be 70mph onshore on the right side of the storm (north) or offshore on the left side (south). Of course, I presume you mean for NYC — in that case, we are hopeful at this point that we won’t be under the center of the storm, though it is possible as there is still spread in model forecasts. The wind field is very large, and so subtle (+/- 30 mile) changes in track for areas that are not near the center won’t make a large difference from what I can see. I am looking at NOAA’s NAM weather model, which is what we use to force our storm surge model, and the peak surface winds are actually very far to the NE (right) of the storm center as it makes landfall at the middle of New Jersey. I just also looked at the GFS model and see a similar landfall location and strong winds all over to the NE, out to perhaps 100 miles. So, if it moves southward, NYC can still get hammered. If it moves a little northward, NYC might get it even worse, due to the inverse barometer effect (if you are at the area with lowest atmospheric pressure, you get a bulge of water levels on the order of one foot). Of course, if it moves even further southward to Delaware/Maryland, the surge will likely not be as bad at NYC. And if it ends up hitting Long Island, then the winds at NYC will actually be offshore so the surge will be stunted. In any case, timing of the peak surge (or landfall, roughly) relative to high tide will be a very important issue, as we have full moon tides. Right now it is forecast to make landfall right near high tide (9pm at NYC), but if it comes sooner or later by 3 hours, that helps reduce the expected flood elevations by a few feet.